When I first started blogging, I posted so much random junk. I wrote stuff that I thought was interesting and then wondered why I wasn’t getting any traffic. 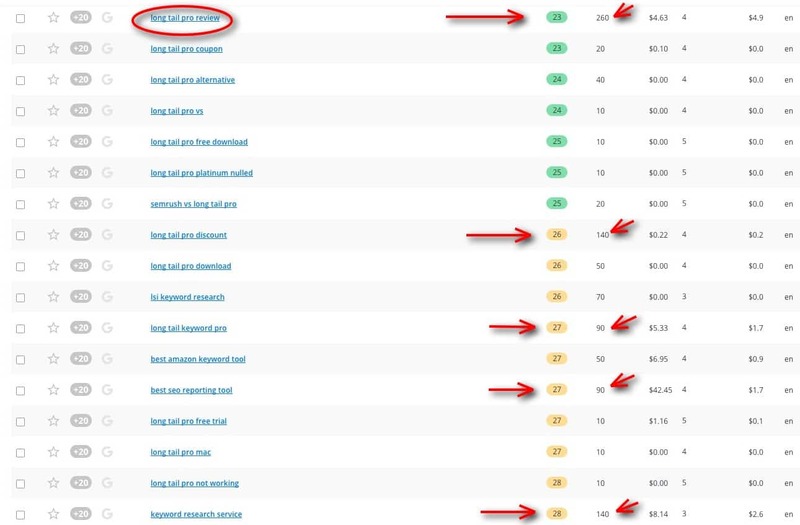 It wasn’t until I did a deep dive into SEO traffic generation that I really started to understand the value of writing content that actually resonated with my audience. Content that was written to help my readers solve a pain point. Then I discovered keyword research and my traffic really started to grow. For my first two years of blogging, I did my keyword research manually through the free google keyword tools. The free Google tools are a great keyword research service and I highly recommend using them to get started. Using the free tools gives you a great foundation in how keywords and SEO work since you have to do so much of the work yourself. As my blog began growing I decided it was time to invest in an actual keyword research tool. 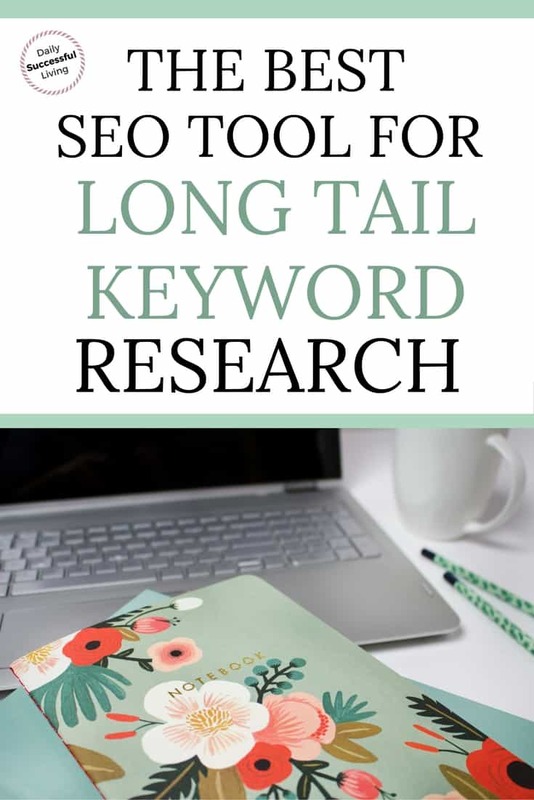 After a ton of research, I decided to use Long Tail Keyword Pro. 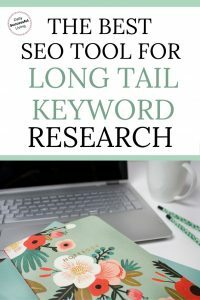 I’ve been using Long Tail for about a year now and have seen a huge increase in traffic as I’ve begun to use SEO planning tools. I’m not a big name blogger or a technical expert. 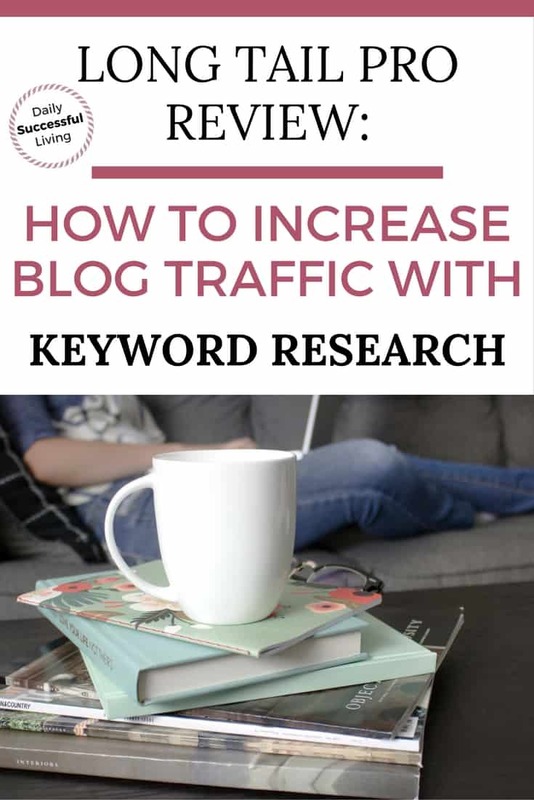 This Long Tail Pro review is designed for beginning to intermediate bloggers who are just starting to get into generating traffic through SEO and already have a general understanding of how keywords work. I use Long Tail Keyword Pro to find keywords related to blog posts. I will typically write 3/4 of my post and then do my keyword research. I’ve found that my writing is more authentic when I write to answer a question rather than stack a post with keywords. Once I have a post mostly written I’ll choose a few key phrases and then run my searches as my Long Tail Pro Tutorial shows below. After doing my research I’ll choose 3-5 relevant phrases and then work them into my post. I’ve found that very simple tweaks to words can really make a difference in the organic traffic to a post. I’ve included examples below of how I use the phrases. 1. After Logging into Long Tail Pro, I go to the main dashboard to do my keyword research. 2. Click on the little plus sign to start a new search. I’ve already run this search which is why it already has the name Long Tail Pro written in. 1. Title your project. I’m super creative and typically use my main keyword as my project title. So in this case I used Long Tail Pro. 1 & 2. Enter the domain name of your website and then click add. 1. 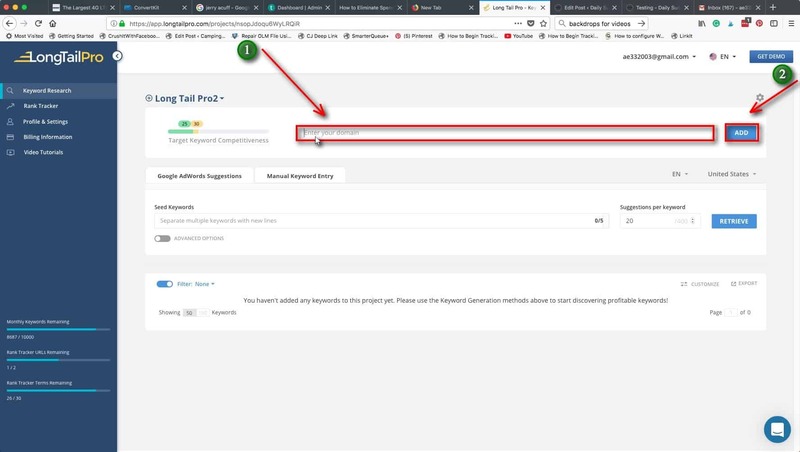 Once you’ve entered your domain name, Long Tail Keyword Pro will automatically generate the Trust Flow and Citation Flow rating for your website. When doing my keyword research, I keep track of my ratings to see how my score is progressing. 2. The main numbers you want to note is the Target Keyword Competitiveness Score (KC for short). Based on the strength of your domain you KC target area may be different from mine. Generally speaking, though anything above 30 is going to be difficult to rank in Google search. The lower the number the easier it is to achieve a high page rank in Google. 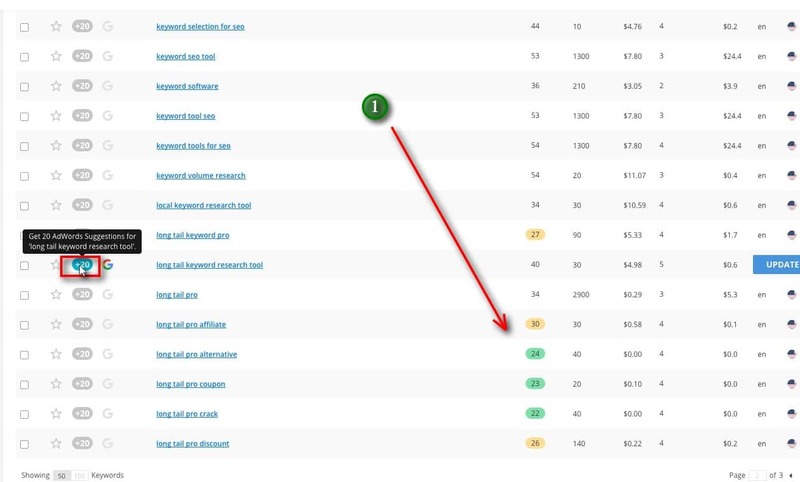 Long Tail color codes the scores which makes it really easy to find the keywords that will work for you. In this case, I have a high chance of being able to rate for anything under 25 and a decent chance of rating for anything under 30. *It is important to still review the higher keywords and include them in your posts since they are still important phrases and help with the overall picture Google is trying to gain of your post. 1. Input your seed keywords. Now you have to wait. Sometimes it can take a minute or two to generate the words, so I typically multitask during this phase. 1. This is why I typically only do 20 words. Once your list is generated it is easy to review the list and choose phases you like. 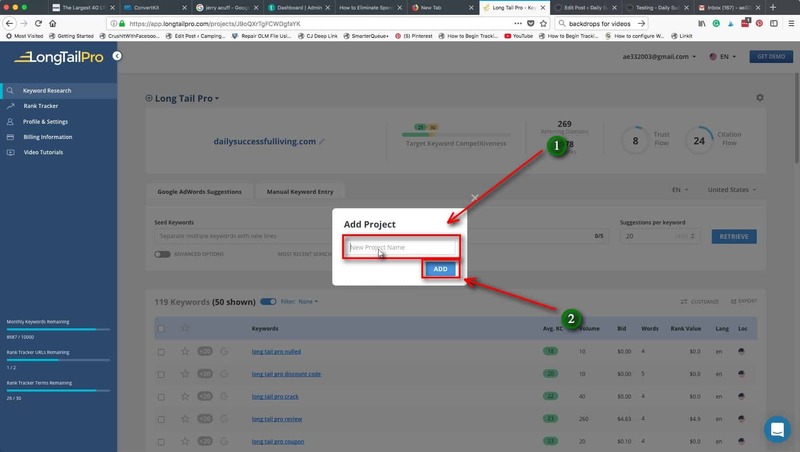 If you click on the +20 button Long Tail Keyword Pro will generate an additional 20 phrases that are related to that keyword. You will receive a notice if there aren’t 20 words to generate. 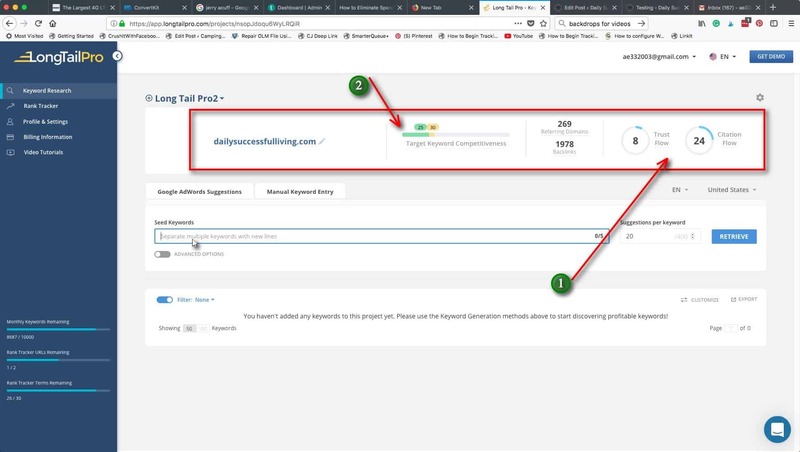 I review my initial results and typically click on 3-4 additional phrases and then do the same things with my next search. My goal is to have 100-150 words to review. Remember it is super easy at this phase to get sidetracked and go down a rabbit hole with side phrases that interest you. I keep a notepad nearby and keep a running list of non-related phrases that are generated that I may want to review later. 2. You can also filter out specific words if you inadvertently pull in a random word. For example, I was running a search on life insurance and kept getting car and auto insurance information. I filtered out both of those words and was able to easily narrow down my results. 1. Once I start seeing highlighted numbers then I’ll stop searching and review my result. If the results are keywords that are relevant then I may keep searching. After a few searches, you get a feel for if you are on the right track with your searches. 1. I organize my search based on the average Keyword Competitiveness score. Once I have everything organized by the Keyword Competitiveness value, I review the volume and then write down the phases that will work for my current post or phases I think may work for future posts. 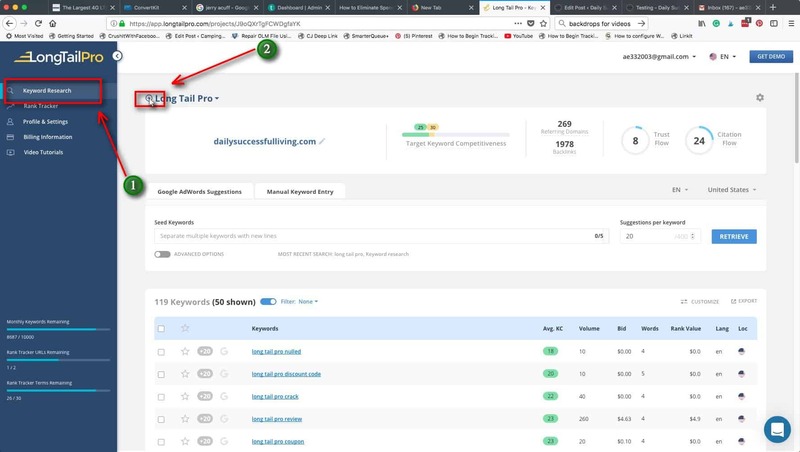 For example, part of the reason I wrote this Long Tail Pro Review was because it had a KW value of 23 with a nice volume of 260 searches per month. I know from past experience that a well-written post with those numbers will mean 15-30 google organic page views per days. Keep in mind that it typically takes Google 3-4 months to index this type of post, so this is a long game. I’m not into blogging for viral content, I’d prefer solid posts that generate strong organic traffic that performs day to day. I know that these numbers don’t seem high, but if you can consistently generate good content week after week and have 20-30 posts that give you consistent traffic you will be a successful blogger. It will take time, but it is doable. PS. I’ll update this post in a few months and give you guys some updates on the traffic I’ve been able to organically generate. 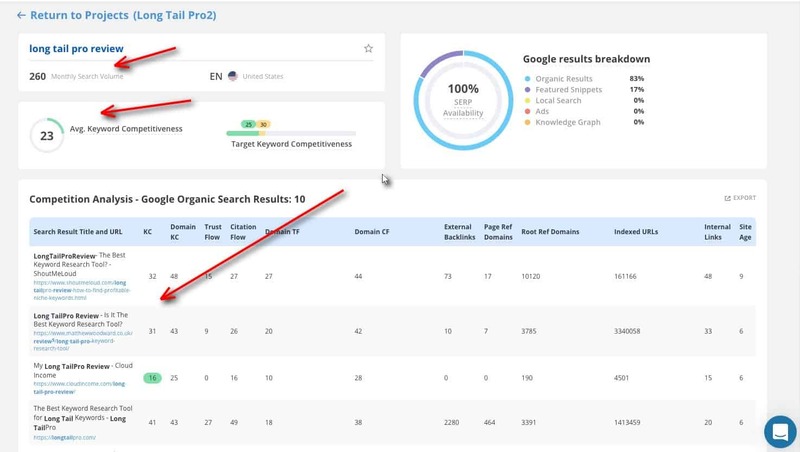 Once you have narrowed down your keywords, it is important to note that if you click on the keyword phrase you can get a more detailed analysis of the phrase. It is important to review the additional information provided for the keyword phrases you like. I always take a few minutes to review the other websites that are coming up under my chosen search term. Typically I’ll click through and review the site. This gives me a good idea of the quality of the posts and what information they are covering. For my post to be successful it needs to be offering just a little bit more than the competition. My first successful post using keyword research was a post called the 6 Advantages of Personal Financial Planning. I posted it 10 months ago and in the last 7 days, I’ve gotten 119 organic visits to my site on this one page. Are those huge numbers, no? But it is consistent traffic that I can count on over and over again. My goal is to write 2-3 posts with similar keyword results each month. Sometimes my keyword research doesn’t yield the results I’m expecting and I’ve had to revamp posts. The more I play with keyword research the more success I’m having at finding phrases that stand out and generate traffic. If you’ve tried keyword research in the past and had limited success, don’t give up. It takes a lot of time to get it right and work out a method that works for you. Keywords aren’t an exact science, but SEO research tools like Long Tail Keyword Pro save me hours of research.